The Knight of Darkness proves that crime does not pay in two pulp classics by Walter B. Gibson writing as "Maxwell Grant." 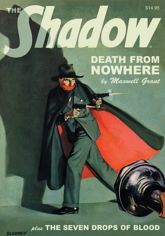 First, The Shadow follows a trail of murder to retrieve the priceless rubies known as "The Seven Drops of Blood." Then, to prove the innocence of a man accused of an impossible crime, the Dark Avenger must uncover the strange secret behind "Death from Nowhere." This volume features the classic color pulp covers by Graves Gladney and George Rozen, original interior illustrations by Edd Cartier, and commentary by Will Murray.